Last weekend, Janine was invited to a social gathering that didn’t require my attendance. I was off the hook. The day was filled with potential. Unfortunately, the weather put a damper on things. The heat and humidity prevented me from starting any projects around the house. The tides in Sandy Hook Bay were not ideal for fishing. I decided to stay at home in the air conditioning and cook something. What, I did not know. A trip to Delicious Orchards in Colts Neck, NJ helped flesh out the menu. Nestled between the first Jersey sweet corn of the season and a pile of Portabellos loomed a purple mountain majesty of local Eggplant! Making Eggplant Parmigiana has turned into an annual event in our household. It’s literally a big production. Once a year, when the eggplants are in season, we devote an entire weekend to it. The sauce is usually made on Saturday and allowed to sit overnight. Work on the eggplant begins early Sunday morning. First they are trimmed, peeled, and sliced. Then salted and allowed to rest until they release a substantial amount of liquid. The real work begins after they are rinsed and dried. A production line is formed on the kitchen counter where the slices are coated with flour, egg wash and bread crumb. Pans of hot oil wait at the end of the line. A quick dip turns the slices golden brown. Several trays are made at once to justify the amount of time and effort the dish requires. Most of them are frozen for future use. I usually question (aka curse) the decision to tackle this project when the flour is strewn about and the oil begins to splatter. Then the first tray comes out of the oven. One forkfull confirms the effort was worthwhile. The glow usually lasts until I realize the mess in the kitchen still needs to be cleaned up. For this recipe, a smooth sauce is preferred. Run the tomatoes through a food mill fitted with a medium disk. Collect the tomato pulp in a bowl. Discard any skins and seeds remaining in the mill. A blender can be used for this task but a food mill is far superior. The blender chops up everything, including seeds, skins and the fibrous membranes inside. These can make the sauce bitter. A food mill essentially removes the pomace from the pulp. Whole canned tomatoes pureed by hand are preferable over canned tomato puree. Canned tomato puree can be too thick for this recipe. The flavor of the sauce develops as it reduces slowly through the cooking process. Heat the Olive Oil in a sauce pan large enough to hold both cans of tomatoes. Add the chopped onions and sauté until translucent. Add the grated carrots and celery. Continue sautéing until the vegetable mixture begins to lightly carmelize on the bottom of the pan. I prefer this sauce to be bright tasting and slightly sweet. You can control the sweetness with the amount of grated carrots added. Use more carrots if you prefer a sweeter sauce. Add less for a more savory sauce. Add the tomato pulp, bay leaves, and crushed red pepper. Stir to combine with the ingredients already in the pan. Bring sauce to a rapid simmer then lower the flame until a moderate steady simmer is achieved. Allow the sauce to simmer uncovered for about 1 hour. Remove sauce from heat when it has reduced by about one third. Adjust seasonings. Cover and Keep warm until the main dish is ready to be assembled. The sauce can be made in advance and kept in the refrigerator for a few days or freezer for longer periods. Trim the ends off the Eggplants and peel with a vegetable peeler. Some prefer to leave a portion or all of the peel on the Eggplant. I prefer to remove it because the flour-egg-bread crumb coating mixture has difficulty adhering to it. Slice the Eggplants lengthwise into ½ inch thick slices. Apply a liberal amount of kosher salt to each side and place them in a colander to drain. Set the colander in an appropriate-size bowl to catch any liquid that is released. Allow eggplant to rest for 1 to 4 hours. This will drain off any excess liquid in the eggplants. Using a colander to drain a large amount of Eggplant may not be feasible. Another method is to line a sheet pan with a double layer of paper towels and stack the eggplant slices, alternating layers of eggplant and paper towels. The weight from the stacked eggplant will help force out the moisture. The paper towels will absorb all of it. This method is very effective but wasteful because it requires a lot of paper towels. Add a pinch of salt to the eggs and beat in a large bowl. Once the Eggplant have released an adequate amount of liquid, rinse any remaining salt off under cold running water and pat dry. Pour about ½” of vegetable oil in the bottom of a large frying pan. Season the eggplant with salt and pepper. Dredge each slice in flour and pat off excess. Dip slices in egg wash and then coat with bread crumb. Make sure each slice has been evenly coated. Fry the eggplant in the hot oil until golden brown. Drain on paper towels or a brown paper bag. Pour 1 cup of tomato sauce in the bottom of the lasagna pan. Tilt the pan back and forth to evenly distribute sauce across the bottom. Sprinkle a generous portion of parmesan cheese on top of the sauce. Layer the eggplant on top of the sauce. Note: Layering the eggplant correctly can be compared to assembling a jigsaw puzzle. The trick is to find the correct shapes to cover the entire bottom of the pan. Cut one of the eggplant slices into appropriate shapes and use to fill the little spaces remaining after the main slices are laid down. Tear little pieces of basil and place evenly over the eggplant. Add another cup to a cup and a half of sauce. Spread evenly over the eggplant using the back of a ladle or a large spoon. Sprinkle with parmesan cheese. 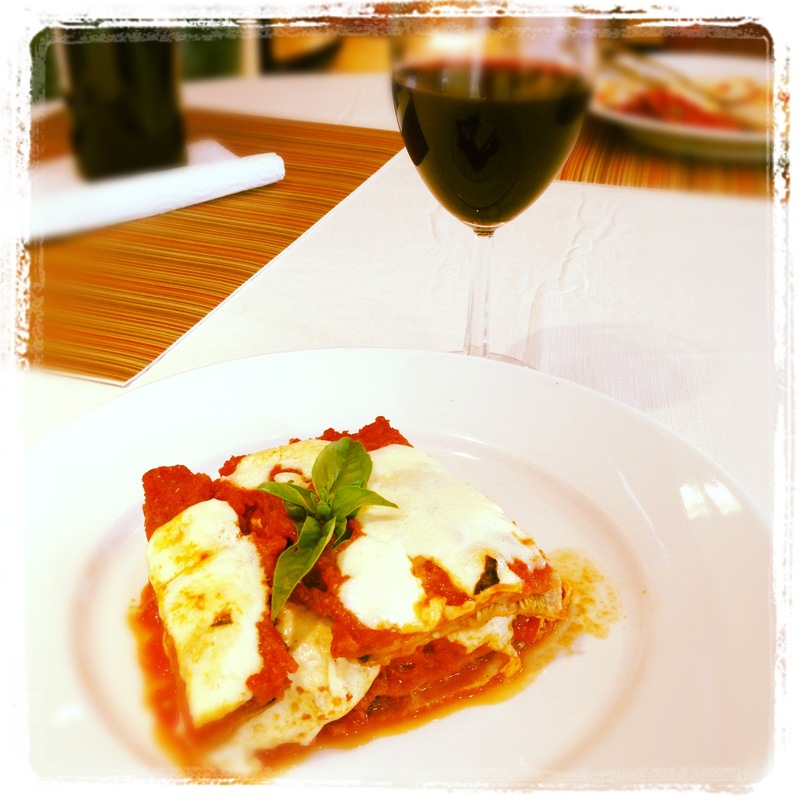 Lay sliced of Mozzarella cheese over the eggplant. Do not cover completely with cheese. 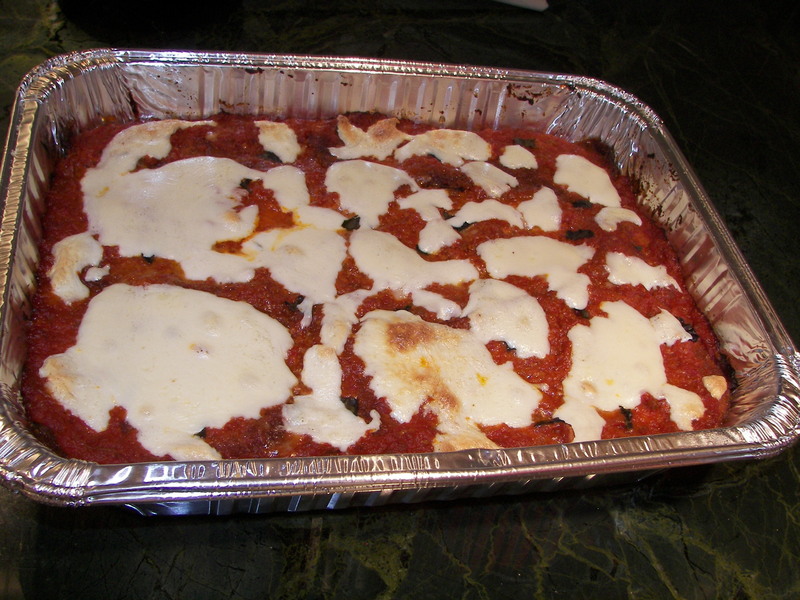 If 9” x 13” lasagna pan yield 8 portions, one slice of cheese should be place on each portion. Repeat the process until the layers of eggplant and sauce reach three-quarters of the way up the side of the pan. Do not overfill. Alternate the position of the eggplant with each layer. For example, if the first layer was laid horizontally, the next layers should run vertically. Top the final layer with mozzarella and parmesan cheese. Bake for 45 minute to 1 hour until the cheese is melted and the top is bubbly. Let cool briefly before serving. Not many people know about detoxing eggplants. You really know what you are talking about! Persians use lots of eggplants in our cooking and we are expert at it. 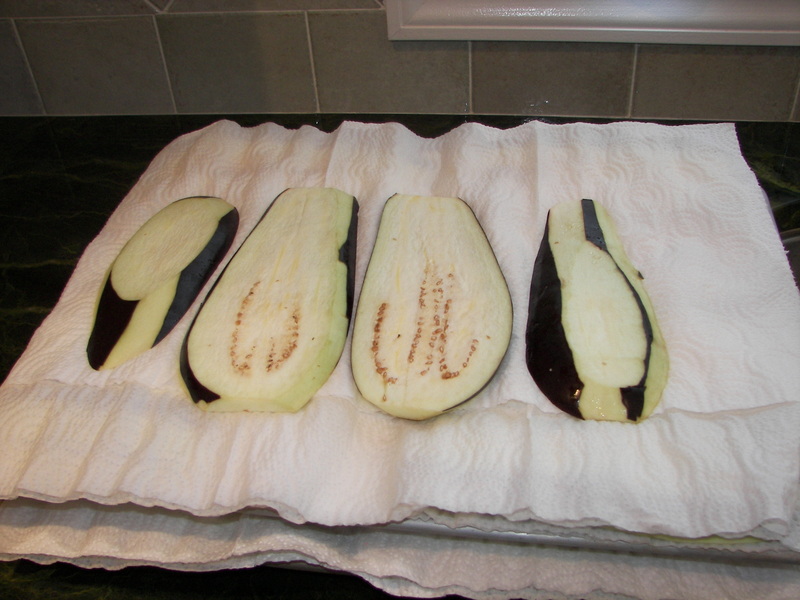 Japanese soak their eggplants in salt water and then rest it on paper towel before cooking. Fae. Sorry, I meant to to say ‘degorging’ eggplants. We’ve found that if you don’t remove some of the moisture from the eggplant before you fry it. The moisture gets trapped inside the flour-egg-bread crumb coating and makes the dish very soggy. Now that winter has rolled into New Jersey, the only eggplants available are spongey and kind of stringy. We can’t wait until early summer when all of the fresh locally grown ones come to market!